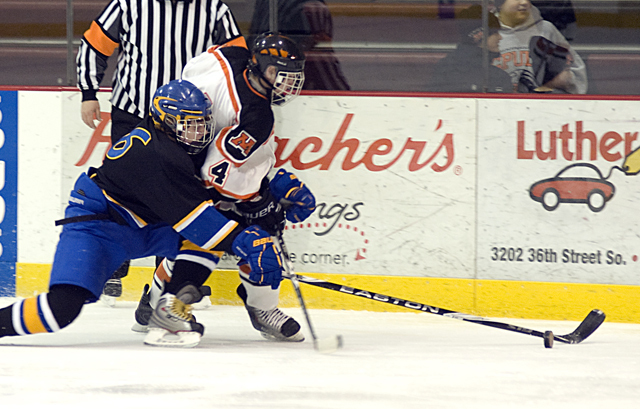 Moorhead breaks winless streak with grinding 4-2 victory over Thief River Falls. 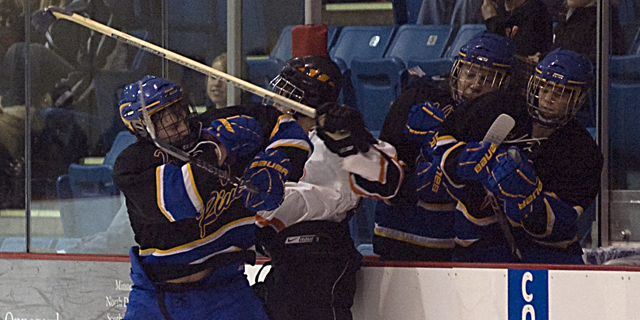 Common hockey wisdom reads that one way to break out of a scoring funk is to crash the net hard. Just dump the puck on the goalie and make his life miserable. It may not be pretty. Just effective. Before Moorhead beat No. 7A Thief River Falls 4-2 on a bitter Thursday, Jan. 7 night at the Moorhead Sports Center, Spuds’ coach Dave Morinville challenged his team to snap out of its own recent cold spell by doing just that. Senior Quin Buckellew certainly got the message. 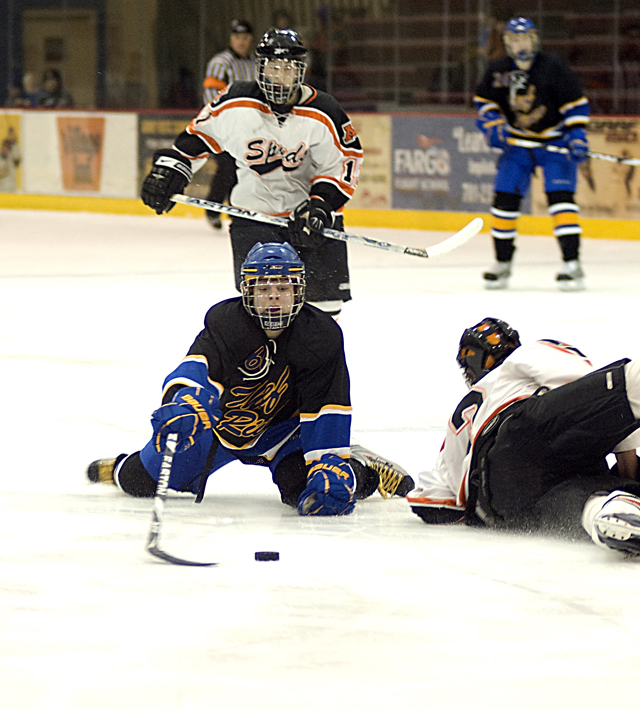 He netted two goals, including the game-winner midway through the third period on a goal-mouth scramble near Thief River Falls All-State goaltender Zane Gothberg. With Gothberg tangled up in a group on the left side of the net, Buckellew picked the puck out the crowd and tried to wrap it around the right. He was met by the Prowlers’ defense before he could complete the move, but the puck deflected off a skate and into the net anyway, giving Moorhead a 3-2 lead. 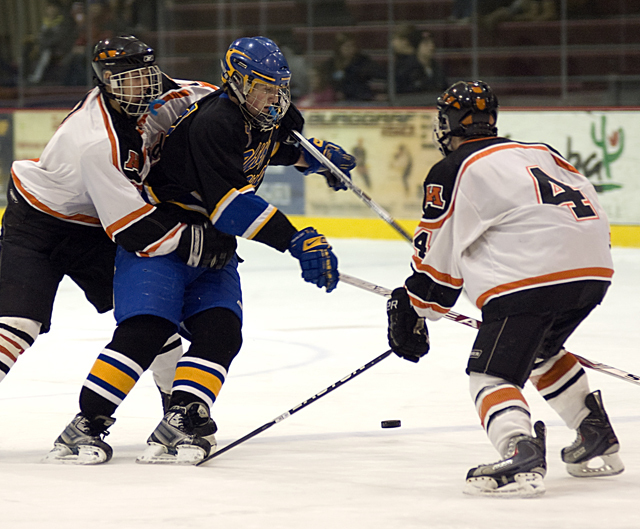 Lucas Melquist added an empty-net goal in the final minute to close out the scoring and end Moorhead’s winless streak at five games. Spuds fans can only hope the victory propels the team forward as it did last winter around this same time. In a disturbing trend over the past two years, Moorhead has had a lull around the holiday season that lasted into January. 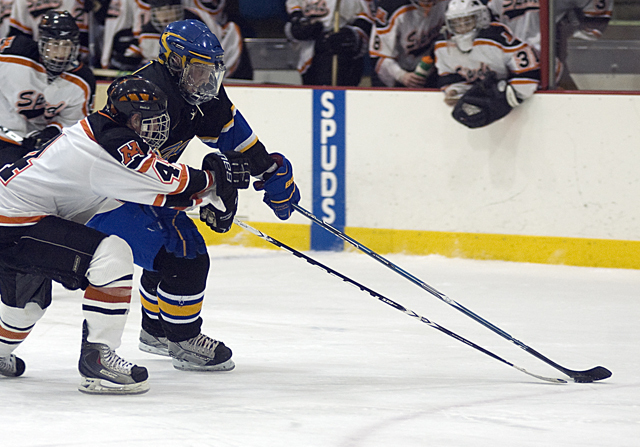 Last winter, the Spuds suffered through an eight-game winless stretch from the Schwan Cup through mid-January in which they scored just 10 goals. Yet they certainly recovered well enough. 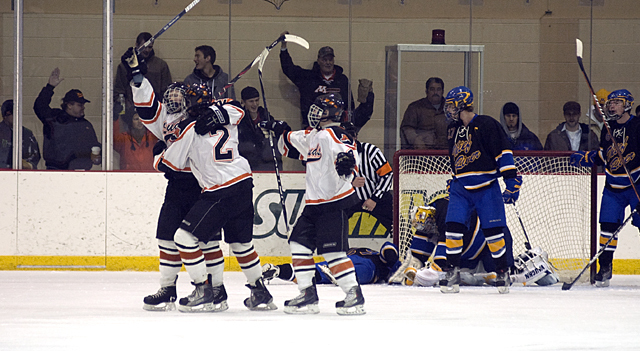 Moorhead advanced all the way to the Class AA state championship game for the seventh time. Heading into Thursday night’s game and beginning with a 2-2 tie at Duluth East on Dec. 22, Moorhead was winless in its previous five games. 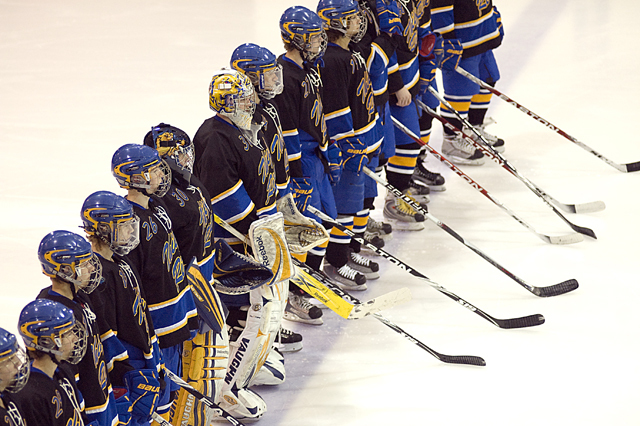 Perhaps beating Thief River Falls will be the same momentum builder this winter. Moorhead got the scoring started early, as senior Lucas Henry directed in a tipped shot from the point by Nate Thompson just 1:04 into the game. 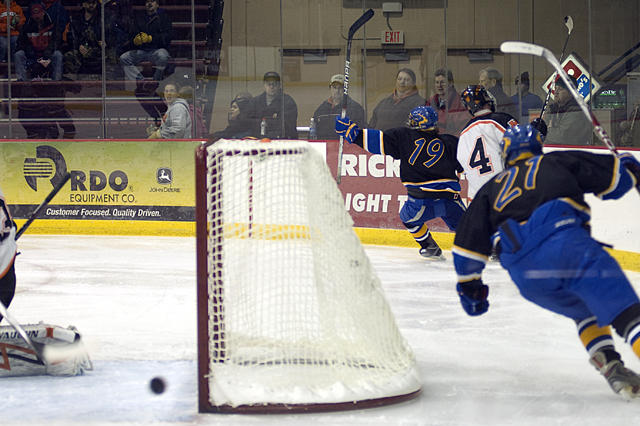 But Thief River Falls scored the next two goals to take a 2-1 lead in the second period. Junior defenseman Matt Audette tallied the first on a power play rush, stepping around the entire Moorhead defense and tucking the puck under Michael Bitzer’s pads. Buckellew ripped a shot over Gothberg’s outstretched glove to tie the score at 2-all late in the second period, setting up his third-period game-winner. 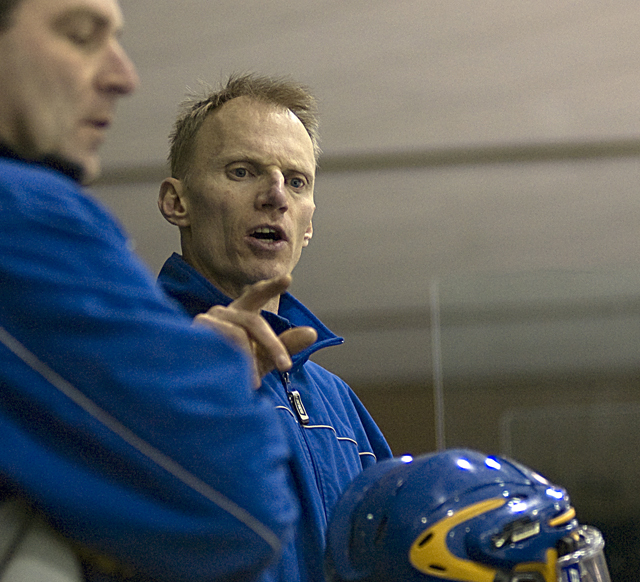 “It was back-and-forth, goal-for-goal,” Thief River Falls coach Tim Bergland said. The game turned when the Prowlers lost their top two centers – Riley Soderstrom and Ryan Crosson -- to injuries partway through the second period and were forced to juggle lines. 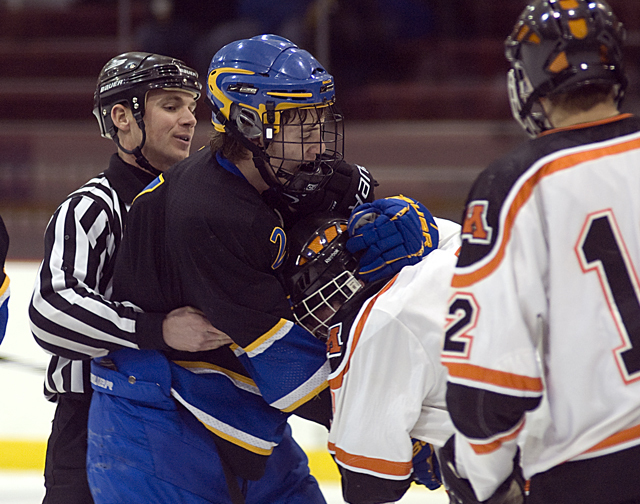 Bergland didn’t want to use it as an excuse, but it definitely affected the Thief River Falls offense over the final two periods. After outshooting the Spuds 10-8 in the first period, the Prowlers had a 30-13 shot disadvantage over the final 34 minutes. “It hurt us and we tried to make some adjustments. But we had some chances to get back in it,” Bergland said. Gothberg made 34 saves in the loss, while Bitzer had 21 saves for Moorhead, which improved to 5-4-2 on the season. 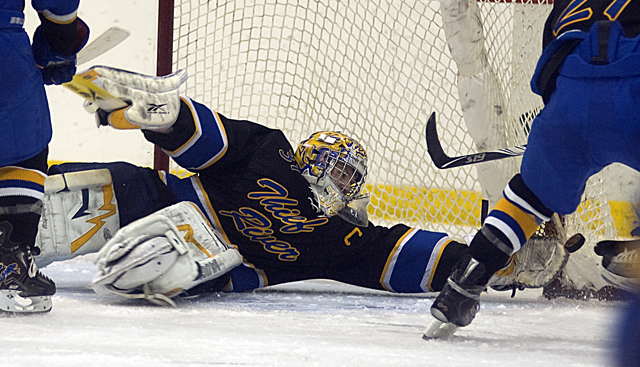 Thief River Falls dropped to 9-4-0. The Prowlers four losses have come against Mariucci Conference rivals Roseau, Warroad and Moorhead and Class A power Hermantown. 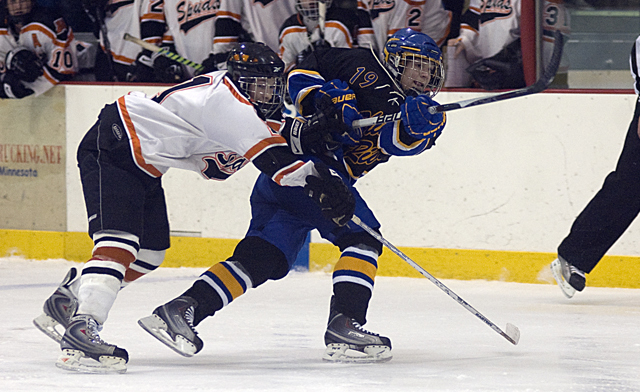 The battling senior forward tallied two goals for Moorhead, including the game-winner in the third period. 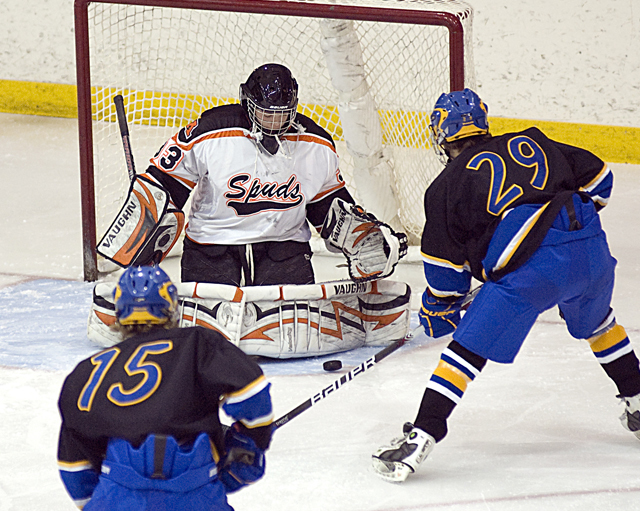 His second period snipe over the glove of All-State goaltender Zane Gothberg gave the Spuds a 2-2 tie. 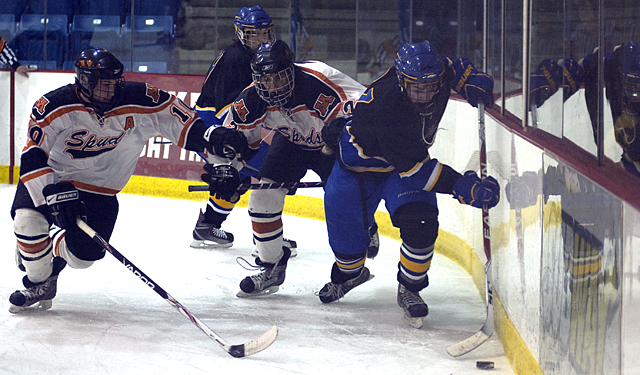 Buckellew notched the game-winner on a wrap-around off a goal mouth scramble. Moorhead's senior defenseman assisted on the first Spuds' goal just 1:04 into the game and later added an empty-netter to seal the victory. 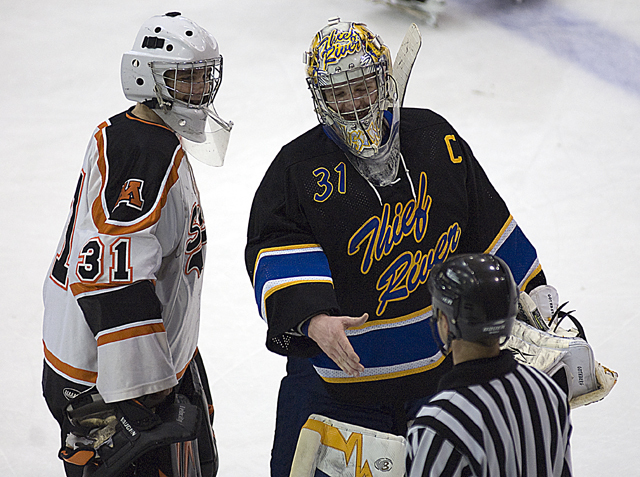 He was also a big part of the Spuds' defensive crew that stymied the Thief River Falls offense much of the game. 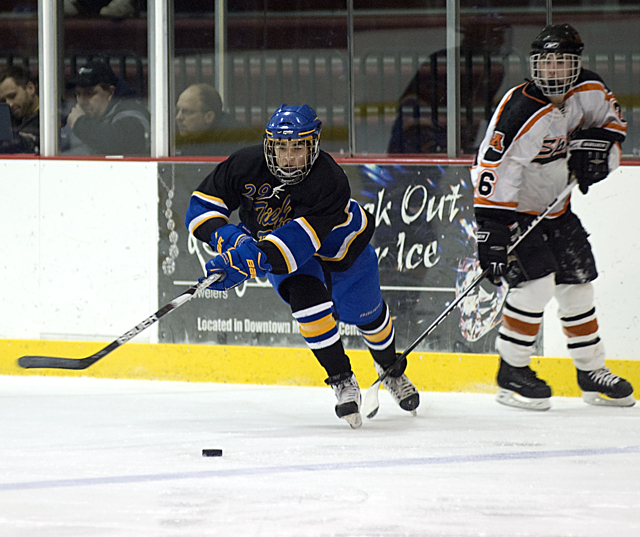 Despite allowing three goals (the fourth was an empty-netter), Gothberg was a big factor for the Prowlers. The North Dakota recruit made 34 saves and was in position as the Spuds hammered away throughout the final two periods.